Arundo versicolor , P. Mill. Aira bengalensis , (Retz.) J.F. Gmel. Amphidonax bengalensis , (Retz.) Nees ex Steud. Amphidonax bengalensis , Roxb. ex Nees. Amphidonax bifaria , (Retz.) Nees ex Steud. Arundo aegyptiaca , hort. ex Vilm. Arundo bambusifolia , Hook. f.
Arundo coleotricha , (Hack.) Honda. Arundo donax , var. coleotricha Hack. Arundo donax , var. procerior Kunth. Arundo longifolia , Salisb. ex Hook. f.
Arundo donax , var. lanceolata Döll. Cynodon donax , (L.) Raspail. Donax arundinaceus , P. Beauv. Donax bengalensis , (Retz.) P. Beauv. Donax bifarius , (Retz.) Trin. ex Spreng. Donax donax , (L.) Asch. and Graebn. Arundo donax , var. angustifolia Döll. Arundo donax is a very tall and robust bamboo-like, perennial grass with large, spreading clumps of thick culms to 6.1 m tall. The numerous leaves are about 5 cm wide and 30.5-61 cm long, and arranged conspicuously in two opposing ranks on the culms. The leaves look like those of a corn plant. Their margins are sharp to the touch and can cut careless hands. The inflorescence, appearing in late summer, is a 0.3-0.6 m long purplish, aging to silver, plume that stands above the foliage. Giant reed spreads from thick, knobby rhizomes. Once established, it tends to form large, continuous, clonal root masses, sometimes covering several acres. These root masses can be more than 1 m thick. The foliage dries to light brown in the winter and rattles in the wind. Striped giant reed (A. donax var. versicolor, has leaves with bold white stripes, and is a smaller plant, to 2.4 m tall (Christman, 2003; McWilliams, 2004). Arundo donax is a hydrophyte, and grows best where water tables are near or at the soil surface. It establishes in moist places such as ditches, streams, and riverbanks, growing best in well drained soils where abundant moisture and sunlight is available. A. donax has also been demonstrated to prefer areas with enriched nitrogen levels. It tolerates a wide variety of conditions, including high salinity, and can flourish in many soil types from heavy clays to loose sands. It is well adapted to the high disturbance dynamics of riparian systems. A. donax inhabits USDA zones 6-11 (Benton et al, 2006; Ambrose & Rundel, 2007). 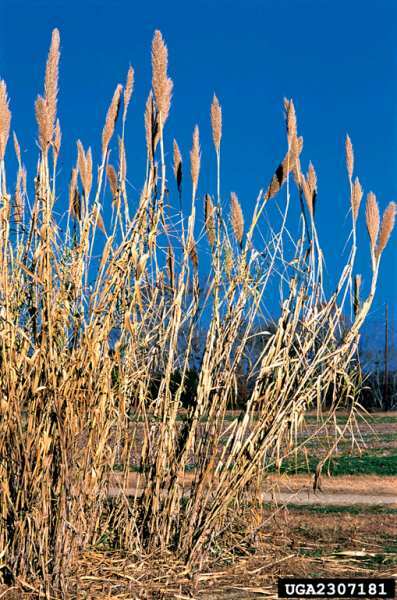 Arundo donax photosynthesizes through C3 fixation which requires abundant sunlight and moisture. It has also been demonstrated to prefer areas with enriched nitrogen levels (Lewandowski et al, 2003; Benton et al, 2006; Ambrose & Rundel, 2007). Principal source: McWilliams, John D. 2004. Arundo donax. In: Fire Effects Information System, [Online]. U.S. Department of Agriculture, Forest Service, Rocky Mountain Research Station, Fire Sciences Laboratory (Producer). Recommended citation: Global Invasive Species Database (2019) Species profile: Arundo donax. Downloaded from http://www.iucngisd.org/gisd/species.php?sc=112 on 22-04-2019. Dense populations of Arundo donax affect riversides and stream channels, compete with and displace native plants, interfere with flood control, and is extremely flammable increasing the likelihood and intensity of fires. It may establish a invasive plant-fire regime as it both causes fires and recovers from them 3-4 times faster than native plants. It is also known to displace and reduce habitats for native species including the Federally endangered Least Bell's Vireo (Vireo bellii). Its long, fibrous, interconnecting root mats of giant reed form a framework for debris behind bridges, culverts, and other structures that can effect their function and disturb ecosystems. Its rapid growth rate, estimated 2-5 times faster than native competitors, and vegetative reproduction, it is able to quickly invade new areas and form pure stands. Once established, A. donax has the ability to outcompete and completely suppress native vegetation, reduce habitat for wildlife, and inflict drastic ecological change (Benton et al, 2006; McWilliams, 2004; Ambrose and Rundel, 2007; Rieger & Keager, 1989). 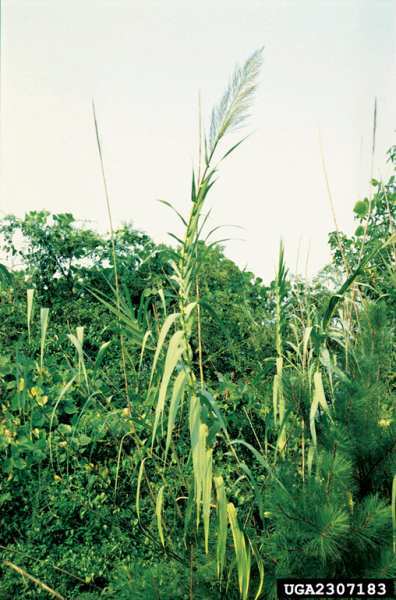 Preventative measures: A Risk assessment of Arundo donax for Australia was prepared by Pacific Island Ecosystems at Risk (PIER) using the Australian risk assessment system (Pheloung, 1995), resulting in a score of 12 with a recommendation \"to reject the plant for import (Australia) or species likely to be of high risk (Pacific)\". A weed risk assessment study of Arundo donax for Queensland, Australia was conducted by Csurhes (2009). The study concluded that to conclude that \"A. donax has the potential to become a significant weed in certain riparian habitats in Queensland, as it has done elsewhere in the world. Areas most at risk appear to be well-drained soils associated with disturbed riparian (freshwater) habitats in the subtropics\". Chemical: The use of systemic herbicides such as glyphosate or fluazipop applied after flowering either as a cut stump treatment or foliar spray have been found to control Arundo donax. Caution should be taken when using such herbicides around water or in wetlands (Benton et al, 2005; PIER, 2008). Physical: Hand pulling may be effective at removing small infestations of Arundo donax, but care must be taken to remove all rhizomes to prevent re-establishment. Cutting is not recomended unless the rhizomes are dug up, as tiny rhizomes can grow into new colonies. Burning is not recomended either as it has been demonstrated to aid the growth of Arundo donax because it regrows 3-4 times faster than native plants (PIER, 2008; Ambrose & Rundel, 2007). Biological control: Native flora and fauna typically do not offer any significant control potential of Arundo donax. It is uncertain what natural controlling mechanisms for giant reed are in its countries of origin, although corn borers, spider mites, and aphids have been reported in the Mediterranean. A sugar cane moth-borer in Barbados is reported to attack giant reed, but it is also a major pest of sugar cane and is already found in the United States in Texas, Louisiana, Mississippi, and Florida. A leafhopper in Pakistan utilizes A. donax as an alternate host but attacks corn and wheat. 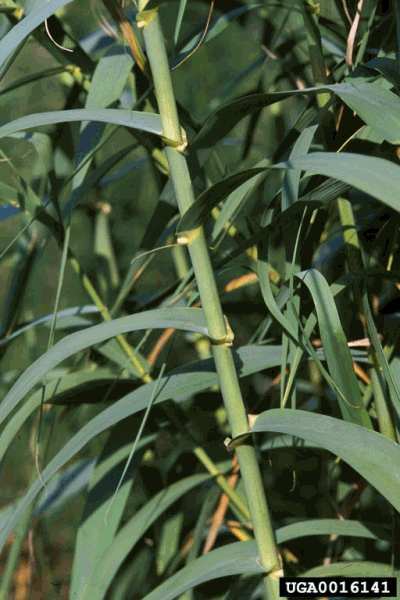 In the United States a number of diseases have been reported on giant reed, including root rot, lesions, crown rust, and stem speckle, but none seem to have seriously impacted advance of this weed. Giant reed is not very palatable to cattle, but during the drier seasons they will graze the young shoots, followed by the upper parts of the older plants. However, in many areas of California the use of Angora and Spanish goats is showing promise for controlling A. donax. Also an unidentified stem-boring sawfly that appears similar to Tetramesa romana has been demonstrated to cuase significant damage to A. donax, and it is being tested in quarantine as a candidate biocontrol agent for it (McWilliams, 2004; Dudley et al, 2006). 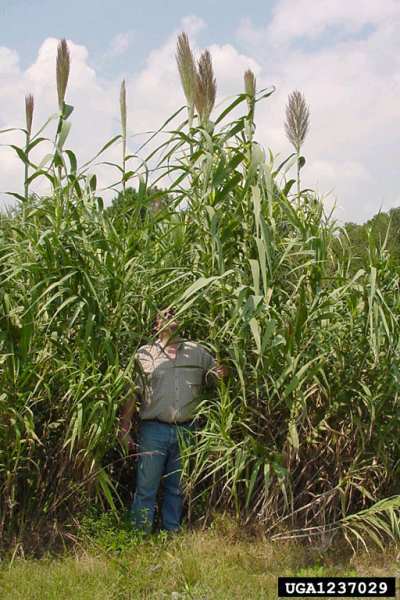 Integrated management: A popular approach to treating giant Arundo donax has been to cut the stalks and remove the biomass, wait 3 to 6 weeks for the plants to grow about 1 m tall, then apply a foliar spray of herbicide solution. The chief advantage to this approach is less herbicide is needed to treat fresh growth compared with tall, established plants, and coverage is often better because of the shorter and uniform-height plants. However, cutting the stems may result in plants returning to growth-phase, drawing nutrients from the root mass. As a result there is less translocation of herbicide to the roots and less root-kill. Additionally, cut-stem treatment requires more time and personnel than foliar spraying and requires careful timing. Cut stems must be treated with concentrated herbicide within 1 to 2 minutes of cutting to ensure tissue uptake. This treatment is most effective after flowering. The advantage of this treatment is that it requires less herbicide and the herbicide can be applied more precisely. It is rarely less expensive than foliar spraying except on very small, isolated patches or individual plants (McWilliams, 2004). Informations on Arundo donax has been recorded for the following locations. Click on the name for additional informations. Aguiar, Francisca C.; Ferreira, M. Teresa; Albuquerque, Antonio; Moreira, Ilidio., 2007. Alien and endemic flora at reference and non-reference sites in Mediterranean-type streams in Portugal. Aquatic Conservation. 17(4). JUN 2007. 335-347. Bell, G. P. 1997. Ecology and management of Arundo donax, and approaches to riparian habitat restoration in Southern California. In Brock, J. H., Wade, M., Pysek, P. and Green, D. (eds.) Plant Invasions: Studies from North America and Europe. Blackhuys Publishers, Leiden, The Netherlands. Benton, N., Bell, G, Swearingen, J.M. 2005. Fact Sheet: Giant Reed. Plant Conservation Alliance. Summary: Available from: http://www.nps.gov/plants/alien/fact/pdf/ardo1.pdf [Accessed 28 April 2009]. Boland, John M,. 2006. The importance of layering in the rapid spread of Arundo donax (giant reed). Madrono. 53(4). OCT-DEC 2006. 303-312. Boose, A. B., 1999. Environmental effects on asexual reproduction in Arundo donax. Weed Research. 39(2). April, 1999. 117-127. Collins, J.N, May M, Grosso C. 2003. Giant Reed Arundo donax. Practical Guidebook to the Control of Invasive Aquatic and Wetland Plants of the San Francisco Bay - Delta Region. Available from: http://legacy.sfei.org/nis/giantreed.html [Accessed 22 May 2010]. Csurhes, S. 2009. 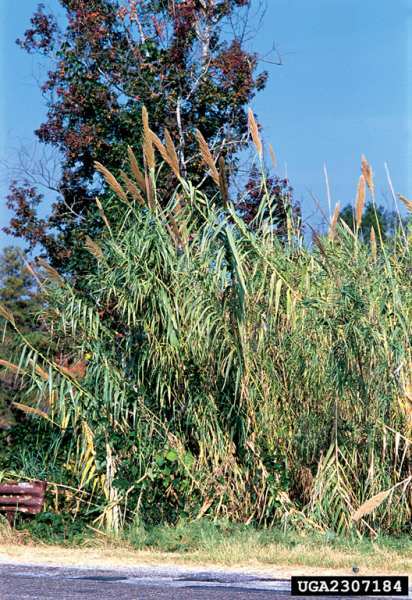 Weed Risk Assessment: Giant reed Arundo donax. Queensland Primary Industries and Fisheries. Decruyenaere, Joseph G.; Holt, Jodie S., 2001. Seasonality of clonal propagation in giant reed. Weed Science. 49(6). November-December, 2001. 760-767. Decruyenaere, Joseph G.; Holt, Jodie S., 2005. Ramet demography of a clonal invader, Arundo donax (Poaceae), in Southern California. Plant & Soil. 277(1-2). DEC 2005. 41-52. DiTomaso, Joseph M; Jacob N. Barney; Alison M. Fox., 2007. CAST Commentary Biofuel Feedstocks: The Risk of Future Invasions. This material is based upon work supported by the United States Department of Agriculture under Grant No. 2006-38902-03539 and Grant No. 2007-31100-06019/ISU Project No. 413-40-02. Dudley, Tom L., Adam Lambert, & Alan Kirk., 2006. Augmentation Biological Control of Arundo donax In CCBC V proceedings editors: Mark S. Hoddle, Extension Specialist in Biological Control, Department of Entomology, University of California, Riverside, CA 92521, and Marshall W. Johnson, Associate Extension Specialist & Associate Entomologist, Department of Entomology, University of California, Riverside. FoLAR RiverWatch Program., 2002. Survey of Invasive Non-Native Plants, Primarily Arundo donax, along the Los Angeles River and Tributaries. Biological Monitoring Component of the FoLAR RiverWatch Program. Sponsered by Friends of the Los Angeles River and San Gabriel Rivers Watershed Council. Bill Neill Principal Investigator. Grossinger, Robin; Janice Alexander; Andrew N. Cohen, and Joshua N. Collins., 1998. Introduced Tidal Marsh Plants in the San Francisco Estuary Regional Distribution and Priorities for Control. This report was funded by a grant from the CALFED Category III Steering Committee administered by the California Urban Water Agencies. Hoshovsky, M. 1986. Element stewardship abstract for Arundo donax, Giant Reed. The Nature Conservancy. Jones, W. A; Sforza, R., 2007. The European Biological Control Laboratory: an existing infrastructure for biological control of weeds in Europe. Bulletin OEPP. 37(1). APR 2007. 163-165. Khudamrongsawat, Jenjit; Tayyar, Rana; Holt, Jodie S., 2004. Genetic diversity of giant reed (Arundo donax) in the Santa Ana River, California. Weed Science. 52(3). May 2004. 395-405. McGaugh, S., Hendrickson, D., Bell, G., Cabral, H., Lyons, K., McEachron, L., Munoz, O., 2006. Fighting an aggressive wetlands invader: a case study of giant reed, (Arundo donax) and its threat to Cuatro Ci�negas, Coahuila, Mexico. In: Studies of North American Desert Fishes in Honor of E.P. (Phil) Pister, Conservationist, edited by Ma. de Lourdes Lozano-Vilano and A.J. Contreras-Balderas, Monterrey, Nuevo Le�n, M�xico:Universidad Aut�noma de Nuevo Le�n, Facultad de Ciencias Biol�gicas. McWilliams, John D. 2004. Arundo donax. In: Fire Effects Information System, [Online]. U.S. Department of Agriculture, Forest Service, Rocky Mountain Research Station, Fire Sciences Laboratory (Producer). Milton, Sue J. 2004. Grasses as invasive alien plants in South Africa. South African Journal of Science 100. pp 69-75. Quinn, Lauren D; Rauterkus, Michael A; Holt, Jodie S., 2007. Effects of nitrogen enrichment and competition on growth and spread of giant reed (Arundo donax). Weed Science. 55(4). JUL-AUG 2007. 319-326. Quinn L.D. and J.S. Holt 2008. Ecological correlates of invasion by Arundo donax in three southern California riparian habitats. Biological Invasions 10, 591-601. Quinn L.D. and J.S. Holt 2009. 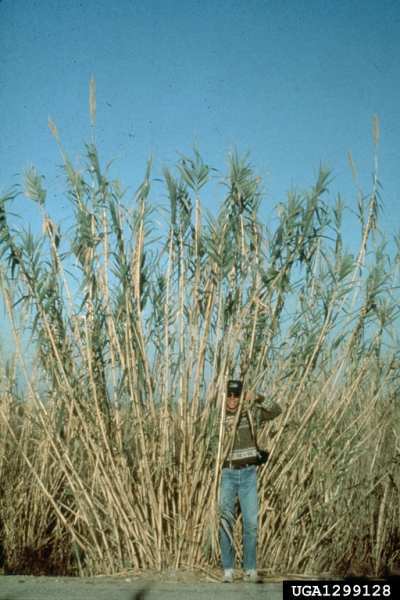 Restoration for resistance to invasion by giant reed (Arundo donax). Invasive Plant Science and Management 2, 279-291. Rieger, John P. and D. Ann Kreager., 1989. Giant Reed (Arundo donax). A Climax Community of the Riparian Zone. USDA Forest Service Gen. Tech. Rep. PSW-110. 1989. Presented at the California Riparian Systems Conference; September 22-24, 1988; Davis, California. Spencer, David F; Ksander, Gregory G., 2006. Estimating Arundo donax ramet recruitment using degree-day based equations. Aquatic Botany. 85(4). NOV 2006. 284-290. Spencer, David F; Ksander, Gregory G.; Whitehand, Linda C., 2005. Spatial and temporal variation in RGR and leaf quality of a clonal riparian plant: Arundo donax. Aquatic Botany. 81(1). JAN 05. 27-36. Spencer, David; Sher, Anna; Thornby, David; Liow, Pui-Sze; Ksander, Gregory; Tan, Wailun., 2007. Non-destructive assessment of Arundo donax (Poaceae) leaf quality. Journal of Freshwater Ecology. 22(2). JUN 2007. 277-285. Spencer D.F., R.K. Stocker, P.S. Liow, L.C. Whitehand, G.G. Ksander, A.M. Fox, J.H. Everitt and L.D. Quinn 2008. Comparative growth of giant reed (Arundo donax L.) from Florida, Texas, and California. Journal of Aquatic Plant Management 46, 89-96. Quinn L.D. and J.S. Holt 2009. Restoration for resistance to invasion by giant reed (Arundo donax). Invasive Plant Science and Management 2, 279-291. Summary: Team Arundo del Norte is a forum of local, state, and federal organizations dedicated to the control of Arundo donax (giant reed), where it threatens rivers, creeks, and wetlands in Central and Northern California. The organization formed in the summer of 1996 (see TAdN History). The Team meets several times per year in the Sacramento area to explore opportunities for information exchange and partnerships in support of the ongoing work of eradication of this harmful weed. This website is an important part of the Team s mission to facilitate networking. We hope you find useful information and contacts at this site and by joining the discussions on the TAdN email listserv. Thornby, David; Spencer, David; Hanan, Jim; Sher, Anna., 2007. L-DONAX, a growth model of the invasive weed species, Arundo donax L. Aquatic Botany. 87(4). NOV 2007. 275-284. Thuiller, Wilfried; Richardson, David M.; Rouget, Mathieu; Proches, Serban; Wilson, John R. U., 2006. Interactions between environment, species traits, and human uses describe patterns of plant invasions. Ecology (Washington D C). 87(7). JUL 2006. 1755-1769. USDA, NRCS. 2009. Arundo donax L. giant reed. The PLANTS Database (http://plants.usda.gov, 26 February 2009). National Plant Data Center, Baton Rouge, LA 70874-4490 USA. Van Wilgen, B. W.; Nel, J. L.; Rouget, M., 2007. Invasive alien plants and South African rivers: a proposed approach to the prioritization of control operations. Freshwater Biology. 52(4). APR 2007. 711-723. Vollmer, Kurt ; Curtis Rainbolt, and Jason Ferrell., 2008. Giant Reed (Arundo donax): Biology, Identification and Management. SS AGR 301 Florida Cooperative Extension Service, Institute of Food and Agricultural Sciences, University of Florida. Original publication date March 2008. Wijte, Antonia H. B. M.; Mizutani, Takayuki; Motamed, Erica R.; Merryfield, Margaret L.; Miller, Dennis E.; Alexander, Donna E., 2005. Temperature and endogenous factors cause seasonal patterns in rooting by stem fragments of the invasive giant reed, Arundo donax (Poaceae). International Journal of Plant Sciences. 166(3). MAY 05. 507-517. Williams, C.M.J., T.K. Biswas, G. Schrale, J.G. Virtue and S. Heading. Undated. Use of Saline Land and Wastewater for Growing a Potential Biofuel Crop (Arundo donax L). Ahmad, Riaz; Liow, Pui-Sze; Spencer, David F.; Jasieniuk, Marie., 2008. Molecular evidence for a single genetic clone of invasive Arundo donax in the United States. Aquatic Botany. 88(2). FEB 2008. 113-120. Angelini, L.G., Ceccarini, L., Bonari, E., 2004. Biomass yield and energy balance of giant reed (Arundo donax L.) cropped in central Italy as related to different management practices (2005)�European Journal of Agronomy,�22�(4),�pp.�375-389. Bell, G., Randall, J. M. and Marinelli, J. 1996. Invasive plants: weeds of the global garden. Brooklyn Botanic Garden Handbook 149. Biswas, Shekhar R.; Choudhury, Junaid Kabir; Nishat, Ainun; Rahman, Md. Matiur., 2007. Do invasive plants threaten the Sundarbans mangrove forest of Bangladesh? Forest Ecology & Management. 245(1-3). JUN 30 2007. 1-9. Christman, S. 2003. Arundo donax. Floridata.com LC Tallahassee, Florida USA. DiTomaso, Joseph M., undated. Biology and Ecology of Giant Reed. University of California, Berkely. FloraBase. Undated. The Western Australian Flora. Department of Environment and Conservation. Herrera, Angelica M.; Dudley, Tom L., 2007. Reduction of riparian arthropod abundance and diversity as a consequence of giant reed (Arundo donax) invasion. Biological Invasions. 5(3). 2003. 167-177. Lewandowski, Iris; Scurlock, Jonathan M. O.; Lindvall, Eva; Christou, Myrsini., 2003. The development and current status of perennial rhizomatous grasses as energy crops in the US and Europe. Biomass & Bioenergy. 25(4). 2003. 335-361. Lonard, Robert I.; Judd, Frank W., 2006. Notes on invasive plants in the Rio Grande Delta of Cameron County, Texas. Texas Journal of Science. 58(3). AUG 2006. 271-277. Meyer, J.-Y. 1998. Observations on the Reproductive Biology of Miconia calvescens DC. (Melastomataceae),an Alien Invasive Tree on the Island of Tahiti (South Pacific Ocean). Biotropica 30(4): 609-624. Quinn, Lauren D.; Holt, Jodie S., 2008. Ecological correlates of invasion by Arundo donax in three southern California riparian habitats. Biological Invasions. 10(5). JUN 2008. 591-601. Smith A. C. 1981. Flora Vitiensis Nova: A New Flora of Fiji. Lawai, Kauai, Hawaii. National Tropical Botanical Garden 2: 423. Tropicos, 2009. Arundo donax TROPICOS-VAST specimen database.